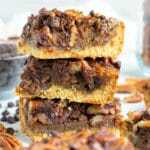 Chocolate Pecan Pie Bars are made gluten-free, dairy-free, and Paleo by starting with an almond flour and coconut flour crust and using pure maple syrup! In a medium-sized bowl combine almond flour, coconut flour, and 3 tablespoons coconut sugar. Whisk to combine. Add remaining crust ingredients and mix until all ingredients are well incorporated and mixture starts to stick together. Press crust into the bottom of a 9-inch square baking dish that has been lined with parchment paper. Go up the sides of the dish ½-1 inch. In the same medium-sized bowl combine all filling ingredients except for the pecans and chocolate chips. Whisk filling until all ingredients are completely combined. Add pecans and chocolate chips to the baking dish. Pour the filling mixture over the nuts and chips and spread it out evenly in the dish. Bake pecan pie bars for 35-40 minutes, or until the top starts to bubble. Let chocolate pecan pie bars sit until cooled to room temperature before cutting. Enjoy! You can use agave nectar or honey instead of the pure maple syrup. You can also use arrowroot or corn starch instead of the tapioca starch.